The Fiji - European Union enhanced political dialogue ended in Suva Thursday where more than 20 agreed actions that are expected to progress into concrete resolutions over the next two years. However, the issue on visa free travel for Fijians to EU member States remains unresolved with further talks to be held. EU’s Head of the Pacific Delegation, Ambassador Julian Wilson says while they have made inroads in development cooperation for climate action and the sugar sector, the ease of travel to the EU remains under discussion. “Those two issues were flagged by your Prime Minister and have been talked about at length and actions are being now agreed to take up with our headquarters, we cannot agree with these issues with myself now as the EU here cause they are member state issues." 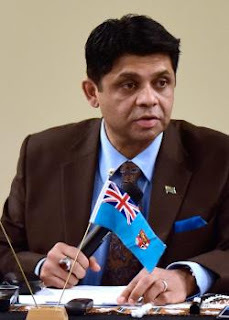 Attorney General and Economy Minister, Aiyaz Sayed-Khaiyum noted that while there’s still work to be done, the Fiji-EU alliance remained strong.